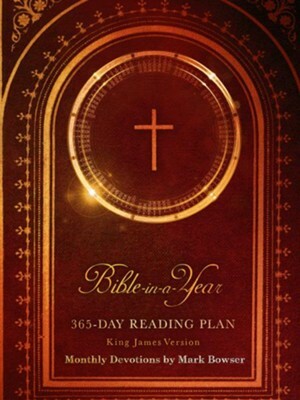 This daily reading plan of the King James Version Bible divides the sacred text of the KJV Bible into 365 sections, with insightful monthly devotions written by celebrated Christian author Mark Bowser. Now, you can read through the entire Holy Bible in one unforgettable year with thought provoking insights from a 21st Century author. Each week daily reading includes verses from both the Old and New Testament.Verses are carefully chosen to repeat a pattern each week, to keep the reading interesting.This daily reading plan is not dated, so you can begin at any time!The Table of Contents is linked so you can conveniently find your place where you left off. If you skip a day, no problem, you can easily begin on the next day's reading.God's Word is living and active, and will continue to provide fresh insights and inspiration as you continue on your Christian walk. Begin your journey today! I'm the author/artist and I want to review Bible-in-a-Year: 365 Day Reading Plan King James Version - eBook.